Get on your Mark, Get Ready, Get Set Go > this is the week that it all begins! Thanksgiving preparations, Christmas shopping, then New Year’s Eve celebrations. There may be a nip in the air here in the MidAtlantic Area, but there are also some heated emotions and high anxiety brewing the closer we get to the holidays. Before you begin to get yourself too stressed, check out these 10 Tips to help you de-stress during the holidays. Leave a few of your own in the comments section as we can all benefit from having a happy and stress-free holiday season. Take a bath, add some Epsom salts to help ease aches and pains and to soothe your mind and body. Try using a lavender scent salt which will provide a calming aroma. Sleep is the most important stress reducer to keep us healthy and relaxed. Don’t let your To-Do list cause you to lose sleep, stay in bed a bit later or go to bed a bit earlier then rise and shine rested and less stressed. Slow down and enjoy the little moments around you. Enjoy and appreciate God’s Gifts; a sunrise, a sunset, trees blowing in the wind or snow flakes falling, slow down and enjoy the moment. Learn to say, “no” and don’t try to attend every meeting or event invite that pops into your email box or on your Facebook timeline. Clear your mind by clearing the clutter from your closet, desk or dresser drawers. Pull out a drawer and sit on the sofa or bed to remove and discard old papers, socks or items that you no longer use. You will feel better the next time you open that drawer and are able to find exactly what you need without digging through the mess. Make and take some time alone to re-center yourself. Sit in a quiet dark corner of your home or apartment or even on the floor of your walk-in closet to pray, mediate and breath deeply. Put on your favorite music then dance or jog in place or run around the house or up and down the steps. Dance like no one is looking to boost your endorphins. Unplug and give your mind a rest from electronic and digital media then pick up a book or a magazine. Curl up and relax with a good story or a “rag mag” that is for “entertainment purposes only” and enjoy the stress-free read. Buffet and Potluck meals are more fun and social than traditional sit-down meals. Ask family and friends to bring a dish and purchase pre-made items to cut down on your time in the kitchen. Let everyone relax and eat as they please then tell some jokes, play games or just catnap the rest of the day away. How do you reduce stress during the holidays? Cut down on time and stress in the kitchen with a Jennie-O frozen, No Thaw Turkey. It goes from freezer to oven to perfect on your table! Disclosure: I am a member of the Jennie-O Switch Circle. All opinions are my own. Are you ready to prepare and/or eat the biggest meal of the season – Thanksgiving – YES!!! It’s not the food that I love, even though it’s a big part of it, it’s the day spent with my family especially now that there are just only four of us which makes it even more special. Hubby’s parents and grandparents, my parents and grandparents are all gone and my extended family, all cousins and just one aunt are in New York and Virginia. I miss growing up with lots of family and friends living closer together sharing the holidays and eating around a large dining room table. I now enjoy cooking for Malik who will be home from college, Tayair and hubby and it warms my heart because it is creating memories for my sons. The week before Thanksgiving I don’t cook a lot not only to save room in the frig and pantry but to also cut back on calories and this Slow Cooked Chicken and Broccoli Crock Pot Meal is just right. Coat the inside of a Crock Pot with Cooking Spray. Add chicken breasts, broccoli, seasoning and Alfredo Sauce. Add 1/4 cup of water to jar, shake and pour remaining sauce into Crock Pot. Cover and cook on high for 4 hours or on low for 6 hours. You can serve this dish over rice but I prefer Angel Hair Pasta. Sprinkle with little Parmesan Cheese and Red Pepper Flakes for some added spice. Next week I am going to give you a Crock Pot recipe to use for the leftover Turkey. I love my Crock Pot and use it not only to save time in the colder months but also in the summer, especially on Sundays. I can prepare a meal before I leave for church and by the time I get home there’s nothing to do but relax until dinner is done. Thanks to Jennie-O I was able to create a Slow Cooked Turkey Cacciatore that the entire family enjoyed. *Disclosure – I am a member of Jennie-O Switch To Turkey Club and received this product in exchange for an honest review. All opinions are 100% my own. My hubby has one favorite meal that he loves to make and that’s Baked Ziti. So when I asked him if he would show me how so that I could make it for him for Father’s Day, he reluctantly kindly agreed. However, I must admit that his version turned out to be much better than mine and it definitely was a lot less messy! After work I stopped at Walmart to pick up the following ingredients but had to make a second trip because I had forgotten the shredded cheese. This should have been the first indication that I wasn’t ready to take over his recipe. However, while there I also picked up a 2-pack of Scotch-Brite® Scrubbing Dish Cloths which definitely came in handy as you can see why! These Scotch-Brite Scrubbing Dish Cloths are textured fiber dish cloths featuring two sides with scrubbing dots on one side so you don’t need to use a scrub brush. Once home, I tried to keep hubby out of the kitchen while I prepared the Ziti but he couldn’t help from popping in and out checking to ensure that I was following his directions. Drain Ground Turkey then put a layer of noodles at the bottom of the pan, top with Marinara Sauce, ground turkey and cheese, stir to mix all ingredients. Repeat with a second layer and top with a more cheese. Hubby said it’s the cheese that makes the Ziti thick and tasty but there is no need to measure it, just add what you want! The pasta and ground turkey was already cooked so I put the pan in the pre-heated oven just long enough to warm and melt the cheese which was about 30 minutes. Obviously, if using a glass pan you should coat with cooking spray otherwise, you will have a baked on mess which is exactly what I had. I poured 1/2 cup of pure baking soda into the pan and then added 1/2 cup of white vinegar. The foaming action began to dissolve some of the baked on mess and the scrubbing cloth took care of the rest. I let the pan soak with the baking soda and vinegar so by the time I had finished eating simply using the non-scratch side of the scrubbing dish cloth had this pan sparkling again. I was ecstatic because the last thing I wanted to do was spend the next hour scrubbing the pan while hubby sat on the sofa watching the game! Needless to say, I will leave the Baked Ziti recipe to hubby so the next time he will have the pleasure of using a Scotch-Brite® Scrubbing Dish Cloth to clean up the baked on mess. These new Scotch-Brite dish cloths are available at Walmart in 2 packs in tan, coral, and navy for $4.98 and there is a $1 off instant redeemable coupon available on the product. The Scotch-Brite® Scrubbing Dish Cloth combines the best of a high quality dish cloth with the power of Scotch-Brite® scrubbing dots so it definitely made for a quicker and easier clean so I was able to join hubby on the sofa before the game ended! Nest weekend I will try another recipe and if you too are looking to try something new, check out these great recipes and cleaning tutorials here . The temps are still kind of cool here in Delaware but at least the sun is out longer making you want to linger outdoors longer. So in keeping with the theme of spending less time in the kitchen this Spring, I made another quick chick, easy breezy, in-and- out of the kitchen in a jiffy recipe using only 3 ingredients! Preheat oven to 350 degrees and line a baking dish with Parchment paper or coat with a Cooking Spray. Tear off two pieces of wax paper and place them onto a cutting board then put one of the chicken breasts on top. Cover with 2 more pieces of wax paper and use the flat end of a mallet to beat the chicken breast until flatten but not too thin – this is good for relieving some stress as well! Be careful to ensure the chicken is always covered with the wax paper, reposition it when it starts to tear. Allow the spinach to thaw before mixing it with the Parmesan and Romano cheese. After you have flattened the second breast, add a few spoonful’s of the spinach and cheese mixture, fold the breasts in half, sprinkle with seasoning and secure with toothpicks. Place the chicken breasts in the preheated oven for approximately 35 minutes or until the chicken is no longer pink and has an internal temp of 165. I put the remaining spinach and cheese mixture in a sauce pan and added a few teaspoons of Apple Cider Vinegar, Olive Oil and minced garlic and cooked on low for 10 minutes. Remove chicken breasts from the oven, allow them to sit for 5 minutes then serve with rice or couscous and enjoy! See wasn’t that a quick chick, easy breezy, in-and- out of the kitchen in a jiffy recipe? We love Barbeque Chicken especially when it’s cooked outdoors on the grill, but when the weather is not conducive to firing up the backyard grill the Crock Pot is the next best thing. Cooking in a Crock Pot is not only quick and easy, it is also very convenient especially when you are snowed in as we were last weekend. Chicken is by far my favorite meat to cook in a slow cooker simply because we do not eat a lot of red meat. I always tease my family, telling them that we eat so much chicken and turkey that I’m surprised that we haven’t sprouted feathers! This 4 ingredient Crock Pot meal is not only one of my favorites but is also a standby because the ingredients are always in the freezer and pantry. Stopping at Shoprite a few hours before the forecasted #2016Blizzard I picked up these All Natural Pre-Cut Diced Chicken Thighs and decided to give them a try. Added to the Crock Pot with 4 cups of frozen onions and peppers, a bottle of BBQ Sauce and a little seasoning made for a perfect Sunday meal which was served over Organic Brown Rice with a side of sautéed Kale. Make sure to coat the inside of the Crock Pot with Cooking Spray to keep the sauce from sticking. You can if you prefer, use a Crock Pot liner but personally I don’t like cooking food inside of plastics. Add diced chicken, top with seasoning and frozen onions and peppers. Pour in entire bottle of Barbecue Sauce then add a little water to the empty bottle, shake and pour over chicken, seasoning and veggies. Adding a bit of water will provide more liquid and you won’t waste the remaining sauce that sticks to the inside of the bottle. Cover and set Crock Pot to low and cook for 4 hours or on high to cook 2 hours. Stir before serving over rice then enjoy! If you can’t grill it, like our friends here did, slow cook it! What is your favorite way to Barbecue Chicken when the weather doesn’t cooperate? My sons are now back in college; Malik is a sophomore down at Bowie State University and Tayair is in his 2nd year of the CLSC program at the University of Delaware, so most nights it’s just “dinner for 2” for hubby and I. Since his retirement he often likes to prepare dinner so that when I get home which is usually after 7:00 p.m. everything is on the table and ready to eat. 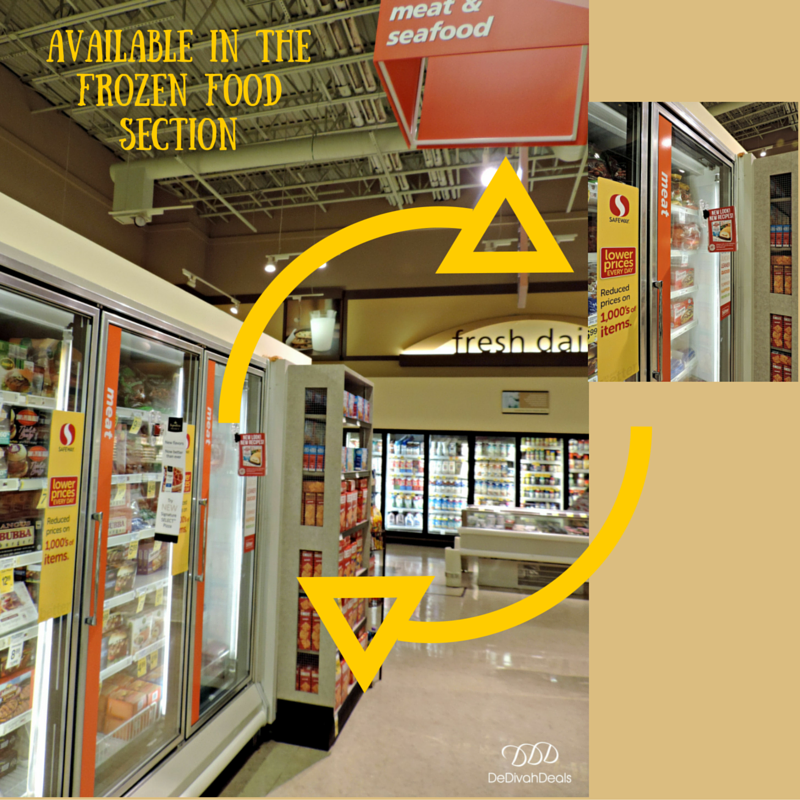 Summer is winding down and the days will be getting shorter so he has been checking out the frozen food aisles for new products to stock up on for when the weather gets cooler. Last week while shopping at Safeway in Glasgow he found Barber Foods new and improved Breaded Stuffed Chicken Breasts which comes in three varieties, Broccoli Cheese, Chicken Kiev, as well as Cordon Bleu, however, since the Cordon Bleu contains ham and we don’t eat pork, it wasn’t an option for him to purchase. However, the other two Barber Foods products are an excellent choice for a mid-week meal especially when served with Fingerling potatoes and a side salad made with spinach, fresh garden tomatoes and sweet peppers. Oh, and by the way, this new style recipe of the Breaded Stuffed Chicken Breasts has a much better taste than the previous versions. Each stuffed chicken breast is a perfectly sized portion and there are 2 individually wrapped entrées in each package therefore, there’s no waste or leftovers to get lost in the back of the refrigerator. Barber Foods Breaded Stuffed Chicken Breasts are made with rib meat and the Broccoli and Cheese variety is filled with broccoli florets and a creamy blend of Swiss and American cheese. The rib meat is raw so it must be thoroughly cooked in an oven, never microwaved until it reaches an internal tempeture of at least 165 degrees which takes about 33 minutes. 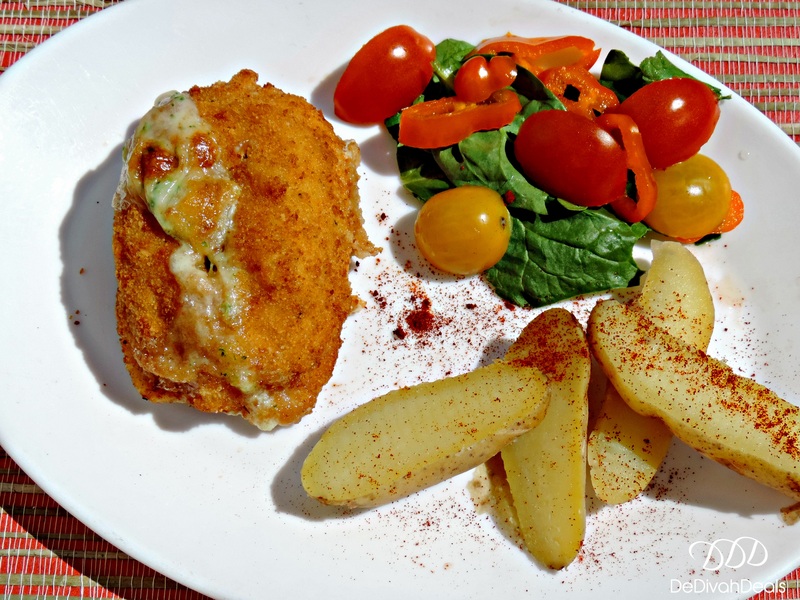 Each breaded stuffed chicken breast must be thoroughly baked and cooled for approximately 2 minutes before serving which means hubby can have a fully cooked meal on the table in under an hour, perfectly timed for me getting home. It probably takes him longer to decide which variety to cook than it does to actually cook it! Barber Foods Breaded Stuffed Chicken can be found in the frozen food section at Safeway and last week they were on sale, oh and if you sign up at www.barberfoods.com, you can get an additional $1.00 off coupon for even more savings. What side dish would you prepare with a Barber Foods Stuffed Chicken Breast? Disclosure: I received the Taco Seasoned Ground Turkey from Jennie-O, however, the opinions are 100% my own. 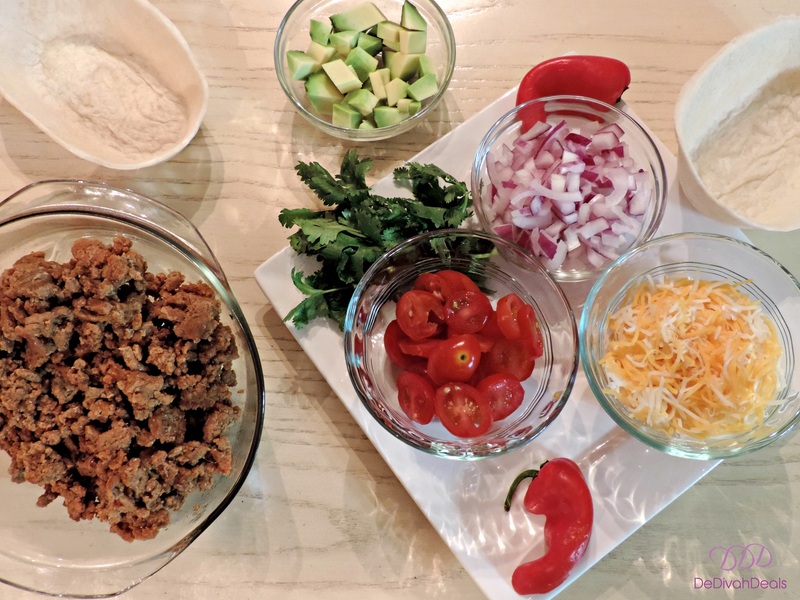 Tacos on Tuesday are hubby and my mini men’s favorite mid-week meal and it is made even more special with Jennie-O Taco Seasoned Ground Turkey. 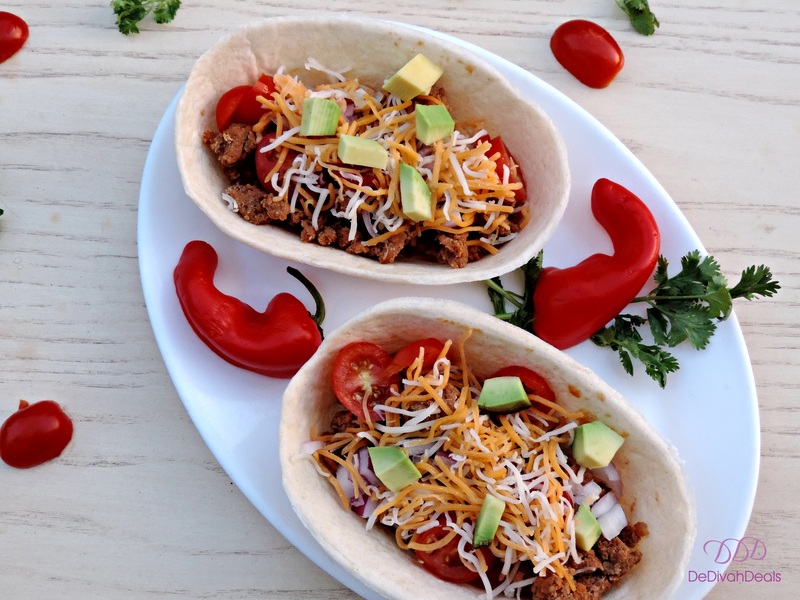 When you use Jennie-O Taco Seasoned Ground Turkey there is no need to add a separate package of Taco Seasoning which is a time and money saver. This lean ground turkey is pre-seasoned with just the right amount of spice; tastes great and contains 70% less fat than regular ground beef which is why it’s has become a staple in my kitchen. 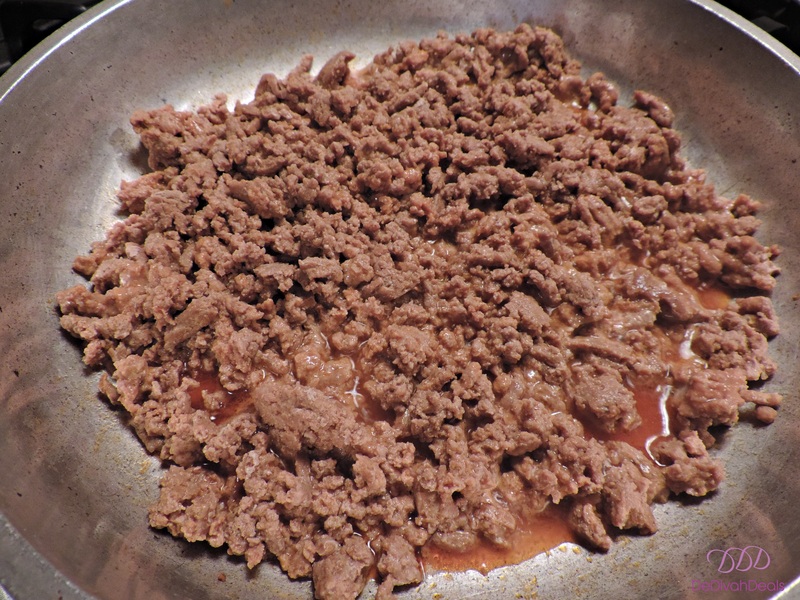 I always pour in a little Olive Oil before adding the Jennie-O Taco Seasoned Ground Turkey to a pre-heated pan then cook it until it’s no longer pink with an internal temperature of 165 degrees. I also use a wooden spatula to break up the ground turkey as it cooks. Once done, we put a few scoops of it into a Taco Boat then top it with diced onions, fresh cherry tomatoes, shredded cheddar cheese and diced avocados. I also like to sprinkle mine with a little hot sauce because you know I like it spicy! You can add extras like shredded lettuce, sour cream or even diced jalapeno peppers and wrap in a tortilla, or add to a hard Taco shell, but we like these Taco boats better. How do you like to top your tacos?